For years I struggled with my weight, chronic pain, and depression. I saw various naturopaths and other alternative healers. Everything helped…a little. But nothing seemed to stick. Until I stopped running on the hamster wheel and started focusing on my self-care in a new way. There are so many forms of self-care that it can get overwhelming (and feel more self-judging than self-caring!). Meditate! Change your diet! Sleep more! Take probiotics! Drink more water! Take an epsom salt bath! Get a massage! Exercise…do yoga…no, do pilates…no, do weight lifting! I realized that in order to make self-care a priority and feel better, I first had to understand what self-care meant to me. Through guided meditation and mind-body exercises, I’ve learned to listen to myself and tune out all that noise. Go to bed early. Do 30 minutes of yoga daily. Meditate daily. Write daily. That’s it. That’s where I place my focus. If I do those things, I know I’ll feel good physically, mentally, and spiritually. For you, self-care might look completely different. The Goldilocks Self-Care Toolbox was created to help you discover your own unique self-care needs. 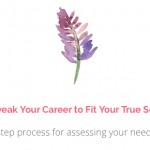 Your Self-Care Toolbox includes lifetime access to a members-only website where you can pick and choose from guided meditations and courses that will help you to better understand and prioritize your own self-care. Want to know what you’ll find in the Self-Care Toolbox? 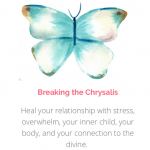 BREAKING THE CHRYSALIS: Heal your relationship with stress, overwhelm, your inner child, your body, and your connection to the divine. 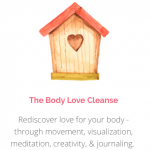 Rediscover love for your body – through movement, visualization, meditation, creativity, & journaling. 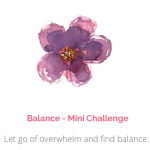 Let go of overwhelm and find balance. Release fear and anxiety. 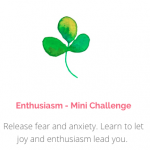 Learn to let joy and enthusiasm lead you. Learn to be in the moment and fully present with what is in front of you. 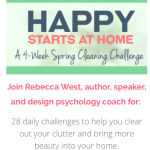 Join Rebecca West, author, speaker, and design psychology coach for 28 daily challenges to help you clear out your clutter and bring more beauty into your home. 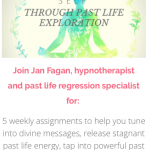 Join Jan Fagan, hypnotherapist and past life regression specialist for 5 weekly assignments to help you tune into divine messages, release stagnant past life energy, tap into powerful past life energy, and feel more present and focused in your life now. 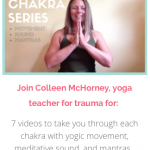 Join Colleen McHorney, yoga teacher for trauma for 7 videos to take you through each chakra with yogic movement, meditative sound, and mantras. 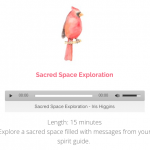 Explore a sacred space filled with messages from your spirit guide. This is more of an exercise than a meditation. 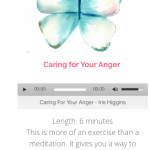 It gives you a way to practice compassion for yourself when you’re experiencing anger. Use this meditation whenever you need clarity around a situation or decision you need to make. 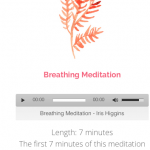 The first 7 minutes of this meditation are a guided meditation. After that, I leave the soothing music on so that you can stay in meditation if you choose to. Stay grounded while opening up to your own unique gifts and connecting with your spirit guides. 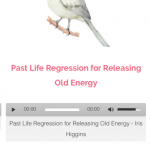 Release past life energy that no longer serves you. 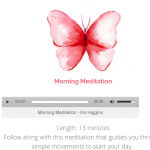 Follow along with this meditation that guides you through simple movements to start your day. Plus extra courses, workshops, and guided meditations coming throughout the year! Bonuses? What are these bonuses you speak of? Who is The Goldilocks Self-Care Toolbox for? The toolbox is for women – or anyone who identifies as female – who want to bring more self-care into their lives. (Honestly it would be helpful for men too, but most of my guided meditations use female pronouns at some point.) The overall focus is on becoming more in tune with your body, your intuition, and what makes you feel happy and healthy. 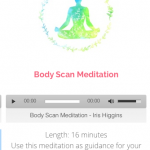 I have found that the toolbox is especially helpful for women who have any sort of chronic health issues because the courses and meditations focus so much on stress reduction and listening to your body. But it would be beneficial for anyone who wants to become more attuned to their own self-care. Hmm…this is a tough one. Who doesn’t need more meditation and self-care in their lives?? As I noted earlier, many of the guided meditations use she/her and so would feel a little awkward for most men (unless you’re a man whose highest self is female…). I may change this in the future to make them all gender neutral but that’s a big project and likely won’t happen for a while. This is a non-refundable offering because everything will be available for you to download as soon as you log in. 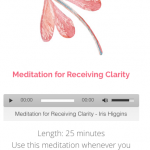 There are plenty of free guided meditations online. What makes The Goldilocks Self-Care Toolbox unique? Ooh…good question. I have listened to tons of guided meditations on YouTube so I totally get that. 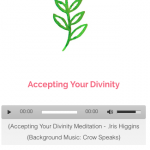 When it comes to guided meditations, you have to really like the style and voice of the speaker, so what I’ll say is you might want to listen to one of my meditations on my blog first and see if you like my style. 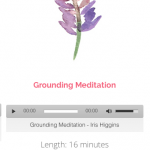 If my voice and style work for you, you’ll love the guided meditations in the toolbox. If not, that’s cool. There are plenty of other options out there, as you know! As for the rest, the courses are awesome and varied! You’ll get more support from me than you would with a YouTube channel. 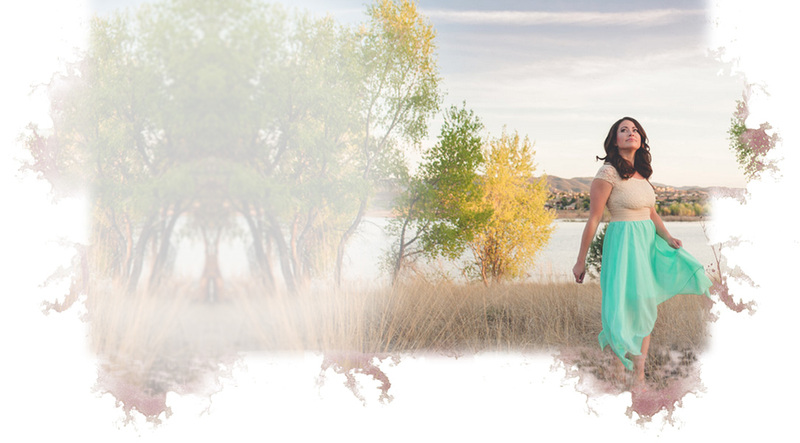 And like I said, I have some bonuses planned that I’m excited to share with members!